One red-light traffic camera in Des Moines gives out more than six times as many tickets as the busiest camera in Seattle. It’s the most prolific traffic ticketer in the region. Des Moines, in southern King County, has a population of about 31,000. The city’s red-light traffic cameras gave out more than 35,000 tickets last year. And the vast majority of those tickets came from just one camera, the Seattle region’s most prolific traffic ticketer. That one camera, which catches drivers turning right off Kent-Des Moines Road, headed north onto Pacific Highway South, gave out more than 24,000 traffic tickets in 2017. That’s about 67 tickets every day of the year, with matching $136 fines. On one weekday morning last week, the enforcement camera flashed eight times in a half-hour. 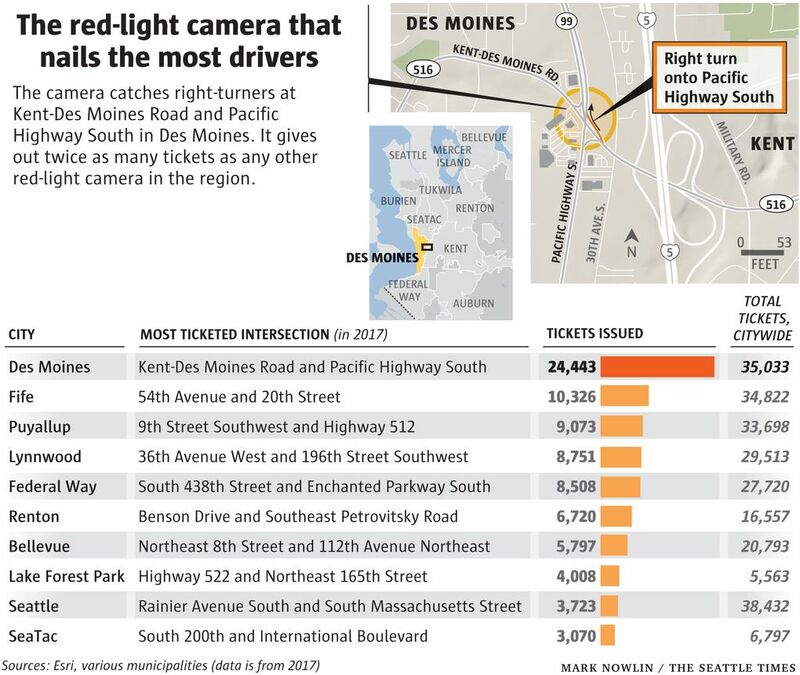 No other red-light camera in the region gave out even half as many tickets in 2017 as the Des Moines camera, according to a Seattle Times review of municipal data. Des Moines declined last week to say how much revenue the city gets from the traffic camera. After paying the contractor who runs the cameras, all revenue goes toward “public safety purposes,” which can include intersection improvements or funding the Police Department. If every person who got a ticket from the one camera paid in full, it would have brought in about $3.3 million last year. Jennefer Johnson, the municipal-court administrator, said only about 40 percent pay in full, while 10 percent fight the ticket and the remaining half either ask and receive mitigation (which generally reduces the fine to about $90), or sign a declaration saying someone else was driving their car, in which case the fine is waived. 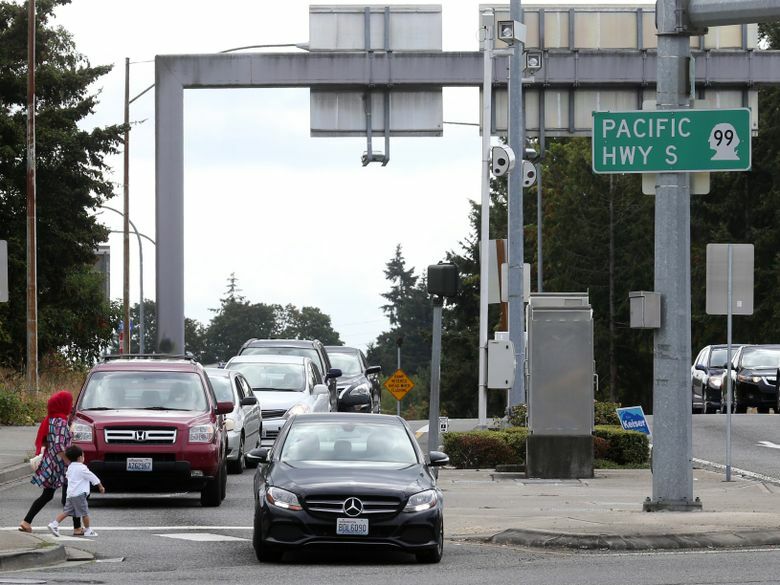 About a dozen Puget Sound-region cities have red-light traffic cameras, intended to curb red-light running and make intersections safer. A 2017 study in the Journal of Safety Research found that cameras reduce fatal crashes at intersections by 14 percent and that removing the cameras made fatal crashes increase by a similar amount. The Governors Highway Safety Association, which represents state highway safety offices, strongly supports red-light cameras and writes that it is “mind boggling” that some cities have removed them. But the cameras have also stirred controversy — nobody likes getting a ticket in the mail for something they didn’t realize they did wrong. Auburn removed its cameras in 2014. 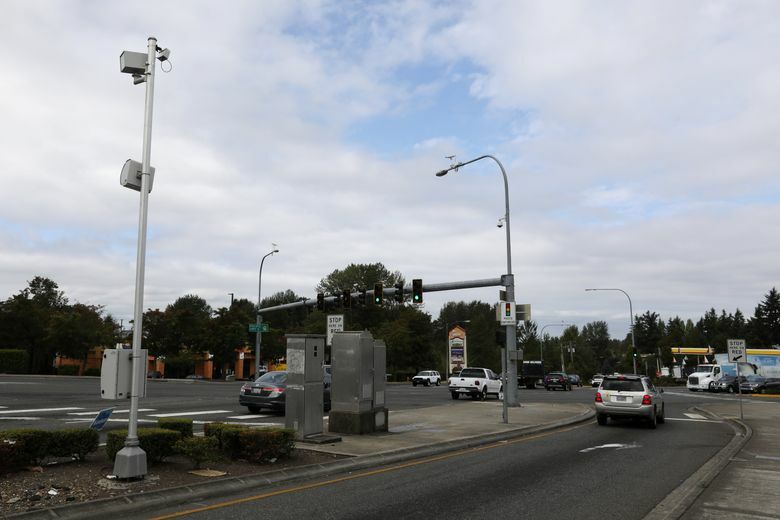 City leaders in Lynnwood, which has had red-light cameras since 2007, have said that they became dependent on the revenue the tickets brought in. 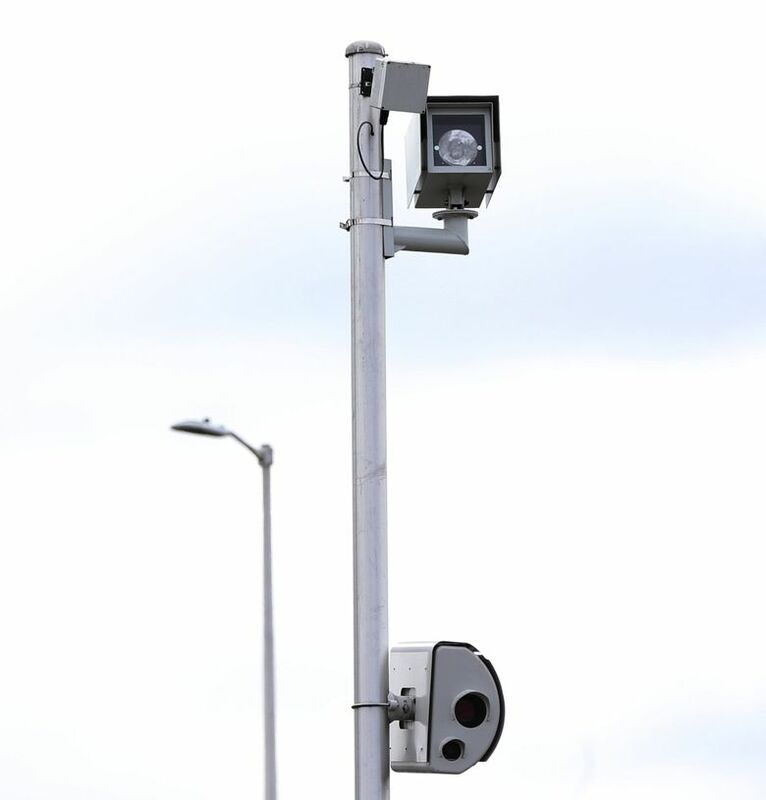 Des Moines isn’t the only nearby city where red-light camera tickets outnumber residents. Fife, in northern Pierce County, gave out nearly 35,000 red-light camera tickets in 2017, more than triple its population. But no single camera in the Seattle region can match the one in Des Moines, which single-handedly accounted for nearly 70 percent of the city’s red-light camera tickets. The busiest red-light camera in Seattle, at Rainier Avenue South and South Massachusetts Street, gave out about 3,700 tickets in 2017, about one-sixth as many as the one in Des Moines. Sgt. Dave Mohr, a Des Moines police spokesman, said he’d been unaware that the camera was responsible for so many more tickets than others across the region. The Des Moines camera is on a slip lane, which allows drivers turning right to veer off diagonally before the intersection, without entering the “box” and crossing through traffic. Such lanes are frequently enforced with a yield sign or a stop sign, but not this one. It has a stop light. There are four separate signs warning approaching drivers that the light is “photo enforced.” But they’re engulfed in a blizzard of other roadside signs — for a hair studio, a state park, real estate, doughnuts, Econo Lube and instructions on which approach should yield. And a big chunk of those tickets go to drivers who think they’re following the law, slowing as they approach the light, but perhaps not coming to a complete stop, or stopping past the painted line, before they continue, turning right on red. But drivers are ticketed both for not coming to a complete stop and for coming to a complete stop past the stop line. John Stewart, 68, drives through the intersection a few times a month, picking up coffee at a nearby McDonald’s on his way to work. He’s been ticketed twice. Des Moines’ seven red-light cameras (the other six, combined, give out about 40 percent as many tickets as the one in question) were installed in late 2016 and immediately had an effect, showing a “much higher rate of violation than studies projected,” according to the city. Filings at the Des Moines Municipal Court increased by 300 percent in the months after the cameras were installed. Johnson, the court administrator, said tickets have decreased by about a third so far this year.